David Freund begins his books with brief descriptions of two riots: one in 1925 where whites attacked a black family that sought to move into their urban Detroit and another riot in 1963 where a white mob attacked a white man for selling his suburban Dearborn home to a black family. On the surface these two riots have a lot in common, with whites attempting to exclude blacks from their segregated communities, but as Freund argues the differences between the 1925 riot and its 1963 counterpart show a complete sea change in white racism. While the whites of the 1925 violent outbreak couched their actions in the language of white biological superiority to supposedly inferior blacks – “scientific racism” – their 1963 successors saw themselves as defending their property against black assertions of unearned privilege and an attack property values – a sort of new cultural and economic racism. Strongly emphasizing that the shift in discourse from ideas of racial difference to more economic and cultural difference was a shift from one racial discourse to another (not as some scholarship would put it, as a shift from racism to “market” forces driving segregation), Freund explains how property came to be “colored” in the post-War United States. Freund argues that this shift was driven by two interrelated factors: the expansion of the definition of “whiteness” and the political and racial economy of the housing and mortgage market. Freund shows that from the 1920s onwards there was a marked expansion of what it meant to be “white” in the United States. Beginning in the 1920s but skyrocketing, with the aid of the federal government, in the post-War years, the edifice of “whiteness” as exclusive WASPy was toppled as previously degraded Catholics, Jews, and Southern and Eastern Europeans “earned” their whiteness with post-War prosperity bringing them firmly into the middle class. Linked to this broad-based “whiteness” were the massive post-War expansion of the white homeownership and the massive expansion of segregated suburbs. The political and racial economy of the American housing and mortgage markets has its origins in the 1920s. The first generation of professional mortgage brokers, real estate brokers, and urban planners read their racial assumptions into the newly codified zoning and real estate laws. These men, and their students, then staffed the federal housing and urban planning agencies of the New Deal (and beyond) that massively helped drive the post-War mortgage and housing market, which promoted a segregated suburbia that favored the expanded “white” middle class. Since the racist assumptions of this new market were submerged in a discourse of “the market”, this encouraged those that benefited from the post-War housing policy to think of themselves not as beneficiaries of a racist, government driven economic order but of a rational “market” that was rewarding their good behavior and punished those who behaved inappropriately. Additionally, the submerged racist assumptions of the mortgage market helped housing segregation survive attacks on the more explicit forms of racism that birthed it. This created a perfect storm of invidious racism. Whites saw black attempts at integration as an interference not with an injustice, but with the “free market,” The post-War housing and mortgage market, in full, “helped give rise to a new kind of racial politics, in which northern whites learned to view inequality-racial inequality, in particular-wholly as a product of free market forces unaffected by legal constraints, political interventions, or coercive action of any kind.” In many ways this sort of racism is even more evil than more “scientific” or “biological” racism because those are explicit racisms. Throughout his book Freund is making three important historiographical interventions. First, he is arguing against the grain of the history of race in America. Traditionally, “scientific racism” is viewed as the most toxic sort of racism for it quantifies racial difference in the body and views racial differences as inescapable. In this story, then, more cultural and economic forms of racism become superior, in that they are easier to combat because they are mutable. Cultural and economic differences can be bridged, biological ones cannot. Freud turns this logic on its head. In his story, cultural and economic racism is worse for it isn’t explicitly racist. “Scientific racism” can be battled by advances in science while the sort of racism that underpins our modern housing and mortgage market has proven difficult to root out. Freund’s second intervention is build upon those scholars who are pushing back against the idea of a “white backlash” undoing the New Deal/Great Society coalition in the 1960s and, certainly in, the 1970s. He ably notes that a backlash to any sort of integration was there from day one, from the 1920s until the 1970s. In fact he goes further than most and argues that most whites were never onboard for racial reform. Thus political change in the United States in the 1960s and 1970s is not the story of a supposedly racially liberal Democratic white middle class becoming more racist as the cultural excesses of those decades but instead it becomes the story of constantly racist white middle class abandoning an increasingly racially liberal Democratic party. Freund’s final historiographical intervention is against the argument that the unique spatial organization of the suburbs is what caused racial segregation in the post-War years. This argument posits that the isolated and anatomizing nature of the post-War suburbs drove segregation. Freund aptly shows that this is not true. Segregation was present from day one in suburban growth, even in the earliest years when the suburbs were spatially no different from the urban area from which they grew. TIE-IN: Despite his vehement paeans to the otherwise, Freund’s book mostly lines up with Tom Sugrue’s Origins of the Urban Crisis. Their basic narrative points are the same; the white backlash was there from day one, politics and federal policy were driving forces in racial inequality, etc. Perhaps, Sugrue emphasizes economics over racism but their basic conclusions and arguments are the same. Freud does push up against Judith Stein’s more optimistic take on post-War politics. Though they do agree that post-War policy makers’ failure to address racial problems as economic ones is what led to continued inequality between whites and blacks. David M.P. 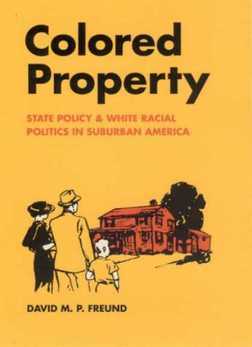 Freund, Colored Property: State Policy & White Racial Politics in Suburban America (Chicago, IL: University of Chicago Press, 2007), 382. Words are Wind Blog at WordPress.com.